It rained through much of the night and we had little motivation to start the day. Breakfast is included with our hotel stay and it is a good one. Breakfast cereals and yogurt, fresh fruit, eggs and sausage, sliced meats, freshly baked breads, and many choices of jams and jellies. After breakfast, I take a nap hoping the weather would improve. Well, at least it doesn’t get worse. 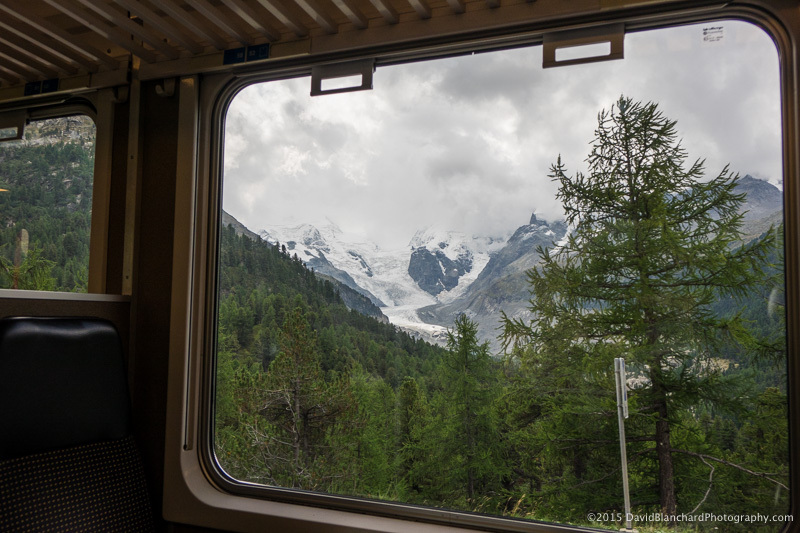 Our first view of the glaciers of the Bernina Alps from our rail car. We don’t want to stay in the hotel all day no matter the weather so we make a decision and grab our wet weather gear. We board the train and travel up valley to Bernina Diavolezza station. 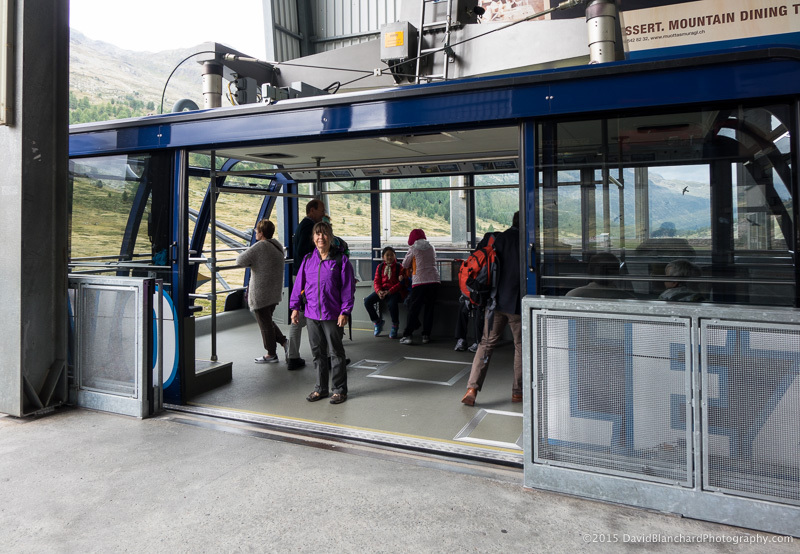 There we take the Diavolezza gondola from 2093 m to 2978 m. It’s much colder and there is some graupel falling. 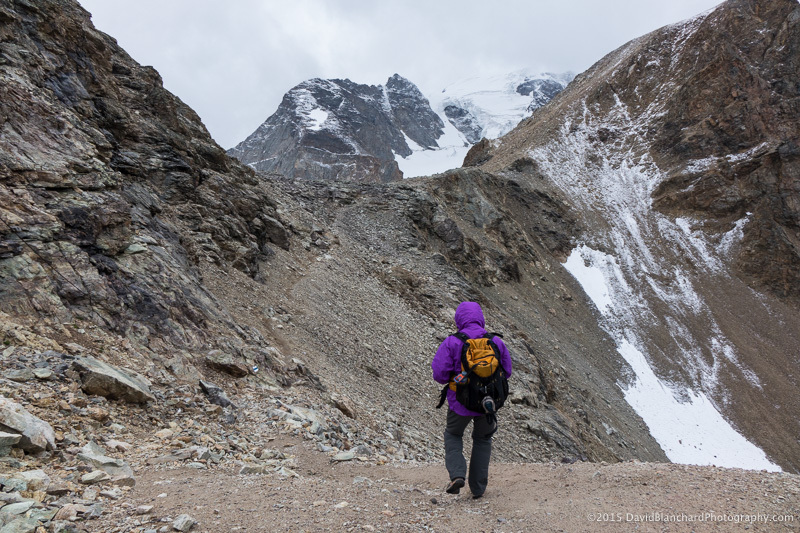 Cold and windy conditions along with some fresh snow make for an interesting hike—especially while wearing Tevas. 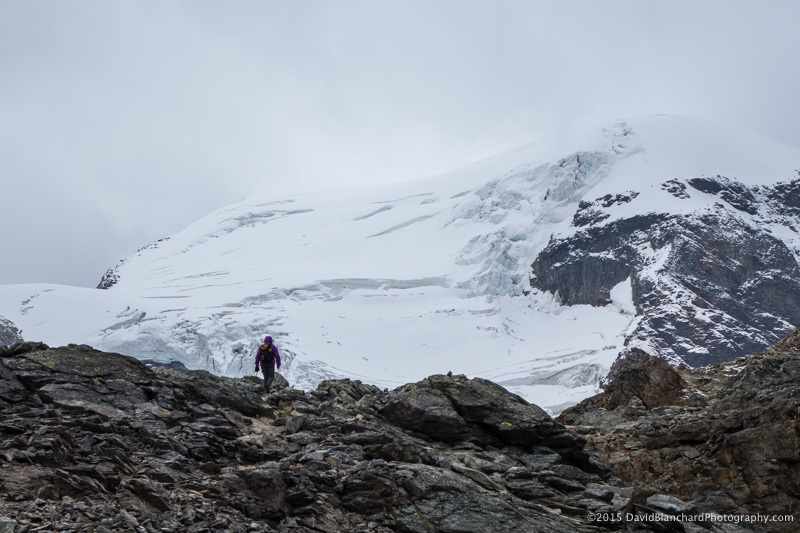 Hiking near Piz Trovat with Piz Cambrena in the background. We embark on a short hike of a kilometer or two near the base of Piz Trovat until we get a different and better view of Vadret Pers (Pers glacier). We’re not too disappointed that we can’t see the peaks because of all the clouds; we expected that before we started earlier today. The weather will improve and we will get our chance! On the way back down, we have an interesting conversation with the gondola operator. He asks us where we are from and is excited to learn we are from Flagstaff. He has been there several times and really enjoyed the city as well as the Grand Canyon. The train arrives a few minutes late. The train back to Pontresina is late. We’ve never experienced a late Swiss train. As we are walking back to the hotel it begins to rain—and it is still raining many hours later. The trails will be wet and maybe even snow covered tomorrow. It should be noted that with a three or more day stay at the hotel you get the Engadin Pass. 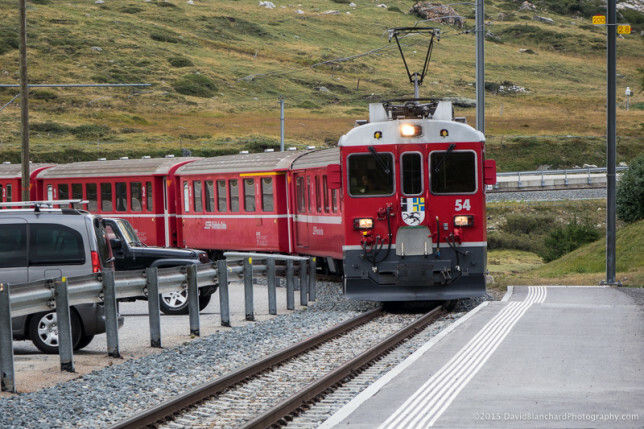 The pass allows you to use buses, trains, cable cars, funiculars, and gondolas within a portion of the Upper Engadin valley for free during your stay. This pass easily saved us anywhere CHF 50–75 each day. It’s a very good deal.